that (as I mentioned in my previous post) I have owned since 1985. 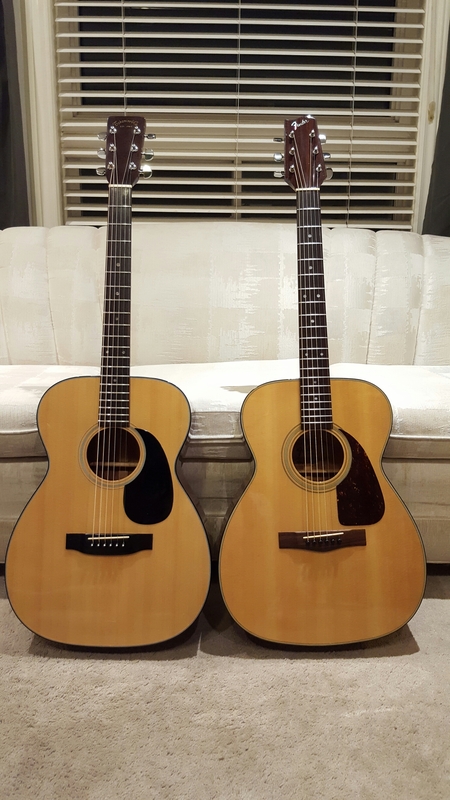 In the side-by-side snappys, found above and below, are the Takamine G306 on the left and the Fender F-200 on the right. Both were considered entry-level at $225 CAD each. 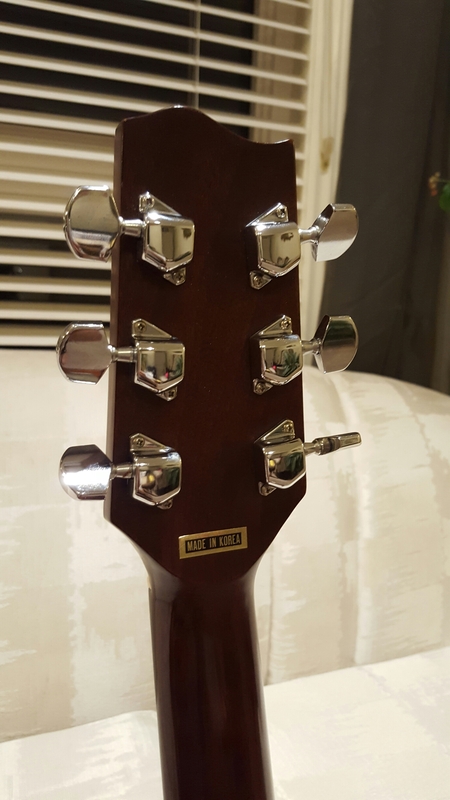 I love the headstock of the Fender. The snappy below was taken just as I had finished restringing and tuning. And yes, in one of the other snappys below, that is the original “Made in Korea” sticker! I don’t know what materials these manufacturers used for stickers in the 80’s but you name the item, be it a camera, some Sony WalkMan or even a guitar – the “made in…” or QC/QA tags stay glued on the item! 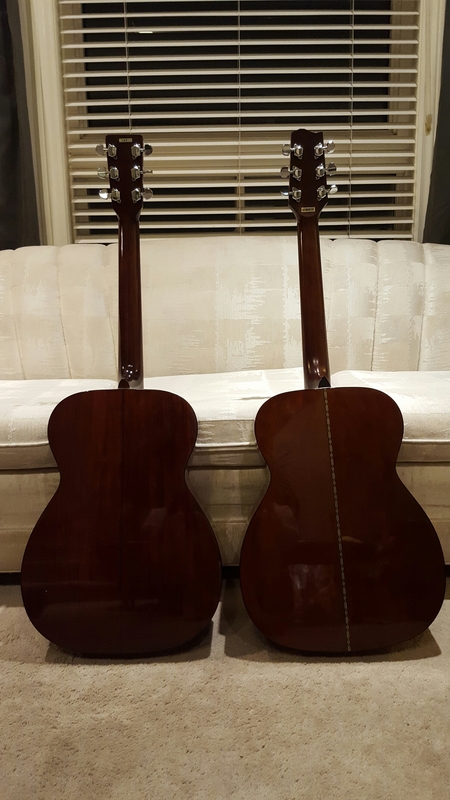 Both guitars are lovely in their own respects, but despite the very similar look and dimensions, those who listen closely will notice they both sound very different. It could be the combination of materials, construction and the slightest difference in details for the body dimensions. As I mentioned earlier, I went against my better judgement choosing to restring this guitar early. I needed something different to do today in order to take my mind away from my day to day stuff. In the snappy below, yes, I noted that the serial number’s first digit says 6. According to some sources, this infers 1986 as the year of manufacture but I do recall my parents purchasing these guitars in the winter of 1985 as Christmas presents for my brother and me, though we don’t have the receipts. I’m hoping that Fender can clear this up but I’m not going to worry about 1 year for a 30+ year old guitar. Lol! 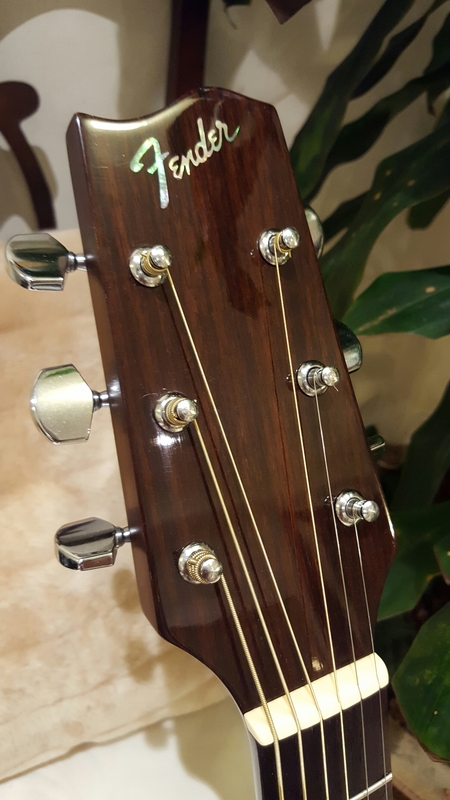 As I spent time at the music store, I decided to venture away from using my go-to D’Addario EJ16 strings for a set of Martin Acoustic 80/20 Bronze Light gauge, so I can’t quite do a baseline comparison of the sound between both guitars…at least not yet. 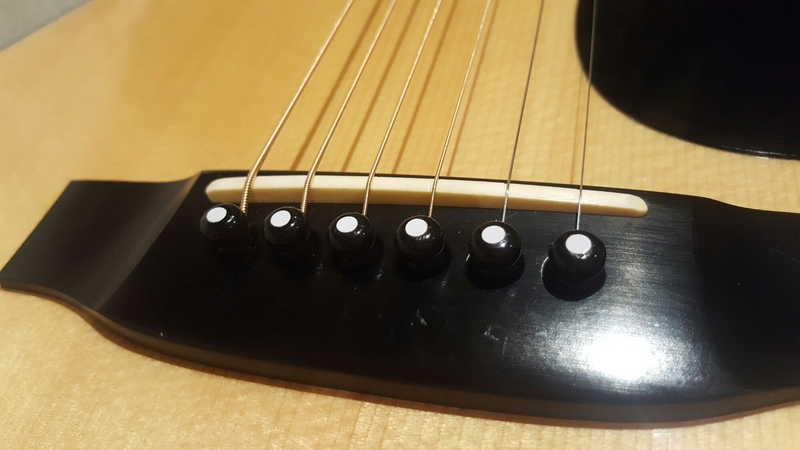 The Martin strings did make the Fender a little more balanced and clear at the bottom end although those same bassy notes were (unexpectedly) a bit more restrained when played in full string chords compared to the Elixir Polyweb custom lights I had just removed. 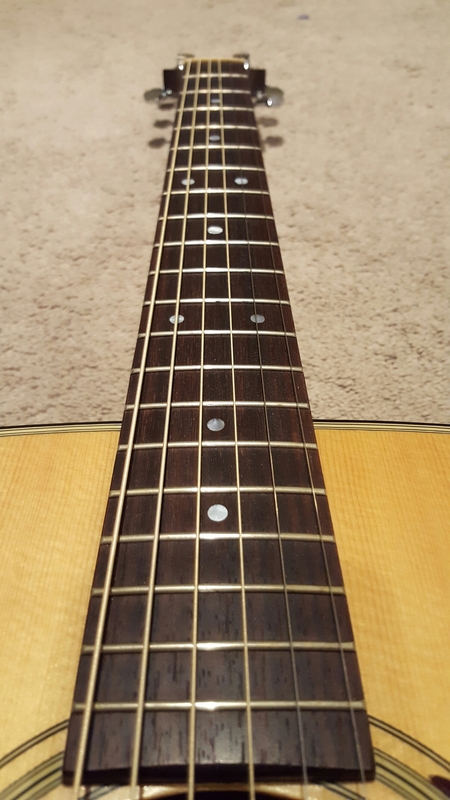 I’ll continue to try the Martin strings for a week, just to see how they pan out after breaking in, then decide whether to switch out. 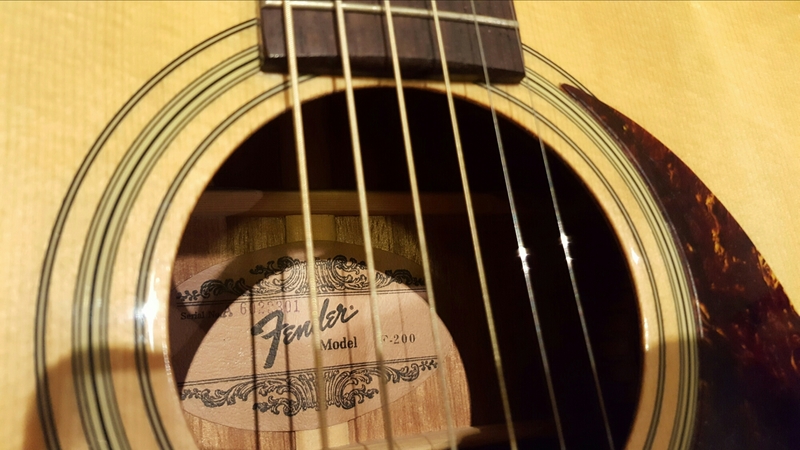 If anyone has a favourite set of strings to use with their Fender, please let me know by commenting below – I’m open to suggestions. On a related note, I love the D’Addario EJ16’s with the Tak – although they don’t last anywhere as long as most Elixirs, the sound is so clean to my ears versus the Elixirs and I can buy a three pack of EJ16’s for the price of a set of Elixir Nanowebs. Back to the Fender, the only part I have changed on the guitar are the bridge pins. Instead of plastic, I bought a set of ebony pins. Being plain black, they made the guitar look a little cleaner and I noticed the sound was slightly darker sounding after the change. 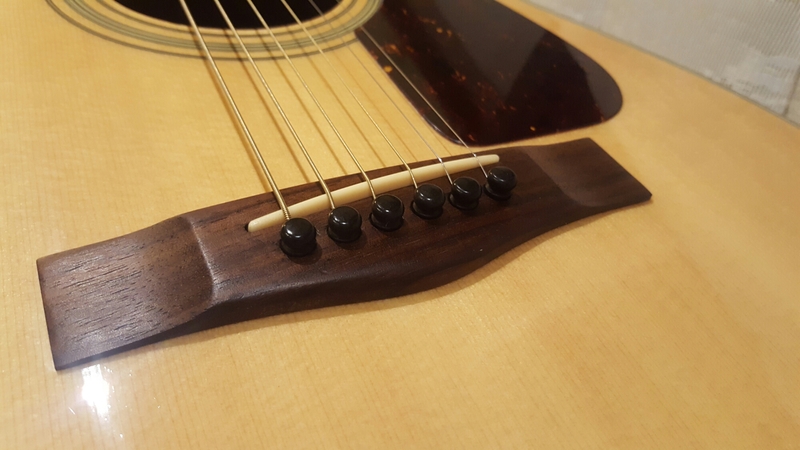 Oh, and speaking about bridges, an update on my Takamine’s saddle: Yeah, I did accidentally flip it, so I had to loosen the strings and remove them (using the ORIGINAL bridge pins – similar to those that were once on said Fender – bwahahahah!) to flip the saddle back to original position. 15 minutes. What a small inconvenience, but at least the intonation is better! I hope you enjoyed! If you do want to read more stuff like this, let me and JP know by commenting below. Don’t forget to like and subscribe. You can also follow us on Instagram, Twitter and our Facebook page! See you there!